In this chapter, we begin our study of the local invariants of Riemann-ian metrics. 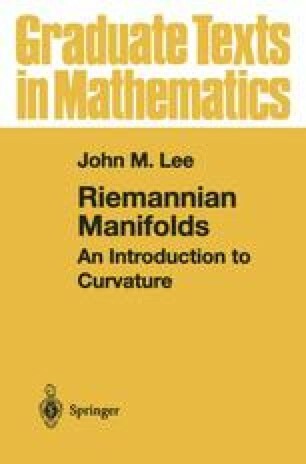 Starting with the question of whether all Riemannian metrics are locally isometric, we are led to a definition of the Riemannian curvature tensor as a measure of the failure of second covariant derivatives to commute. Then we prove the main result of this chapter: A manifold has zero curvature if and only if it is flat, that is, locally isometric to Euclidean space. At the end of the chapter, we derive the basic symmetries of the curvature tensor, and introduce the Ricci and scalar curvatures. The results of this chapter apply essentially unchanged to pseudo-Riemannian metrics.